It’s time for an anime review! It’s been a little while since I reviewed one so it’s time to get back in the swing of things. Unfortunately, Kino’s Journey is one of the weakest anime that I have seen in a long while and doesn’t hold up well. Despite the dated animation and unlikable characters, the show does have something going for it. Kino’s Journey is only 13 episodes. Beyond that, it’s a pretty tough ride and not a title that I would recommend for aspiring anime fans. Kino’s journey is about a girl who drives around on her talking motorrad. She is a traveler, which means that she has no place to call home and simply visits towns as she travels the world. Her only rule is that she can never stay in a place for more than 3 days. She gets to see the worst of humanity and its best. Just about all of the episodes are stand alone adventures and some episodes even have 2-3 stories within them. As with most anthologies, this means that some episodes are good while others are really bad. Unfortunately, the latter is usually the case. Since the series is so short, lets take a look at most of the episodes. The first episode has a Twilight Zone esque feel as Kino arrives in a town where machines do everything. Humans now live by themselves and avoid each other. The reason for this is that they have mastered telepathy and now know each other’s dark secrets. They are all so dark and mysterious that they can’t even look at each other. Kino listens to the sad tale and drives off, admiring the irony of how they originally just wanted to get to know each other better. This was a good way to start the series. It was an interesting episode and the plot was sound. It may not be very exciting, but it was decent enough. Unfortunately, the second episode was the worst in the series and shot the series right into the gutter. Kino was driving across a snowy mountain when she noticed three human traffickers dying of hunger and thirst. She quickly murders a few rabbits and give them to these crooks, but not before they ate the people they were carrying. Kino quickly dashes off and realizes that she should have spared the rabbits instead of the humans, but 20/20 hindsight won’t be winning Kino any points. The episode is so dark and grim that it’ll just make you shake your head. Reading memes about Harambe is more thought provoking than this episode as Kino just proves that she has a lot more respect for saving humans than animals. The series really never recovered from this episode. The third episode is an anthology inside of anthology. It was a little on the boring side since most of the stories didn’t have enough time to actually do anything. The first story is all right as a guy states that the world will be ending soon, but then another guy says that he counted the days wrong so it won’t be ending quite yet. Kino takes the opportunity to nab as much free food as she can and heads out. Another town showed up, which lived only to entertain travelers. Kino got out of there quickly to ensure the town’s demise. Well, the episode was a lot better than the second one. Next was the episode where we finally saw Kino’s origin story. She lived in a twisted town where all kids had to undergo an operation to turn into adults. Luckily, a guy named Kino showed up. He was a traveler so he didn’t want to interfere, but when he saw that the town was going to murder Kino, he quickly stepped in. They murdered him and went to get Kino, but she escaped on the motorrad. This was the turning point where she lost her personality, design, and character in exchange for gun skills. It was a pretty fun episode and it shows how many towns are actually pretty twisted and you have to either get with the program of get out. I recommend the latter. The 5th episode was fairly interesting even if it was a little repetitive. Kino discovers a land where there is an infinite cycle made by 4-5 guys. One guy spends his whole life taking apart the tracks, another guy spends his life putting them back, another guy polishes them, etc. They are all working together, but don’t see the other guys since they are a few miles apart. This means that none of them will ever make any progress or be able to return home to their families. It’s a shame, but they are getting paid so I suppose they should be grateful for that. Not to mention the fact that they technically could go home, but choose not to do so for some crazy reason. Kino decides not to mention any of this since she doesn’t want to change the customs and just tells them stories as she rides on. This was a good, calm episode. The next two episodes contained the tournament saga. These episodes were the only ones with real action behind them so that was neat. Kino entered a tournament where she had to fight a lot of opponents to the death. Kino wanted to win without destroying anyone and steadily climbed the ranks. Then she realized that the leader was pretty corrupt so she decided to break her traveler law and shoot the guy in the face. A pretty dramatic Hunger Games esque ending to that event. Well, the tourney was pretty fun, but Kino was a jerk to everyone as per usual. She refused to keep anyone in the loop and just did what she wanted when she wanted to. At least this proved that she is certainly a very good fighter and someone who should be feared. It was a fun two parter. The next episode had Kino be a supporting character for once as another character decided to build a plane. She did pretty good and completed the task. There’s not much to this episode, but there’s nothing wrong with it either. If anything, the main character was a definite improvement over Kino so that’s always a good thing. The one after that involved a land where books are forbidden aside from really family friendly ones. Naturally, that means that Kino didn’t like the books since she needs something with a little more edge to it. She meets a delusional author who believes that reality is fake and everyone starts chasing each other and the episode loses its sense of purpose by the end. There were fires and a lot of crazy stuff, but the episode was pretty jumbled and didn’t make too much sense by the end. It was all right I suppose, but Kino really needs to stop getting in everyone’s way if she’s not actually going to do anything to help. Episode 10 saw Kino head to a house where the family were robots. It takes Kino a really long time to figure this out, but at least it means that she will get free meals all the time. Kino ultimately decides to move on, but it was a decent enough resting place I suppose. Robots get more realistic each day eh? The next episode was another anthology esque episode where Kino remembers the good ole days. There’s a boat and a lot of stories, but we can skim over this episode as well. It wasn’t really an attention grabber. The last two episodes certainly are, but I’m afraid that this is not in a good way. Kino heads to another evil country where two powerful lands have decided to band together and murder people for sport. Whoever murders the most people wins. The two lands do this every so often and are pretty proud of themselves. Kino doesn’t bother to stop them or do anything about it since she’s just a traveler, but she does take a few shots at the people who are being murdered. In her defense, they tried to murder her first as it’s their past time to let their aggression go after being hunted. It’s a pretty vicious cycle of violence, but as mentioned earlier, it doesn’t matter to Kino if her neck isn’t on the line. She just drives off. It’s another really dark episode that makes you really dislike Kino. Finally, we have another really dark episode. Kino heads to a town that is about to be destroyed in three days. The adults know it, but most of the kids do not. The parents have decided that the kids have to die alongside them, but they’ll spare Kino. Kino doesn’t know about this until she leaves and sees that everyone has died. Well, at least Kino has lived so now she can go watch more tragedies and suffering with the strange traditions that people have. Not a bad plan eh? Kino’s Journey decides to end the series on this low note and I do have to question a lot of its decisions. As you can guess, I really didn’t like Kino. She’s easily one of the worst anime main characters that I’ve come across. By visiting all of these lands and not actually interfering unless it’s something that personally offends her, Kino is basically an accomplice to the crime. She can fight and actually could help people out, but purposefully chooses not to do so. There’s really no point to her journey and she should feel ashamed for making all of these bad decisions. Injuring animals, Watching people die, chatting it up with the villains, you just have to wonder whose side Kino’s on. She seems to just be in it for the thrills. Her cold personality is certainly fitting then as she always gives very vague answers, acts rude to everyone that she talks too, and also has a pretty bland design. There’s really nothing to like about Kino and it’s a shame since she was fairly all right in the flash back episode. The only other real character in the show is the motorrad. The motorrad is fairly bland was well though as half of his lines are just repeating what Kino just said or asking a really obvious question. The motorrad was always super annoying and the voice was so raspy that you just knew that he was doing it on purpose. I don’t blame him since Kino’s no mean all of the time, but I was never invested in any of the characters. I think the old Kino could have ended up being more interesting, but at the same time maybe not. The other Kino also didn’t like to interfere, but he did prove that he would help in a pinch when he saved the current Kino. That makes me think that he has a slightly stronger moral compass. A shame that current Kino couldn’t learn from his example. The animation is rather sub par and certainly one of the weakest ones that you will be seeing. The colors are all pretty faded out and you’ll notice that they reuse a lot of scenes to save on the budget. Watch out for Kino’s daily gun practice and how she starts up the bike in every episode. It just gets annoying after a while and even if the animation isn’t great, the show could have used some nice backgrounds to bluff its way past that. The show just looks a lot older than it actually is. It came out in 2003 and yet the original seasons of shows like Pokemon and One Piece can take it on. That’s a little sad. The soundtrack is also not very good. The theme song’s a little on the boring side and the music inside each of the episodes is very lifeless. You’ll forget the tunes as soon as they pop up. That’s not a great way to make people more excited about the actual episodes. Not by a long shot! 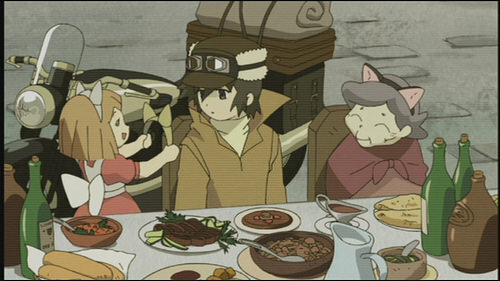 The main problem with Kino’s journey is just how dark and depressing the whole show is. There is nobody to root for and Kino herself drags the show down. If it wants to go the Twilight Zone route and have episodes where we can see places with a lot of strangeness, then tragic endings can work a little better. It still shouldn’t go as extreme as Kino’s last two though. 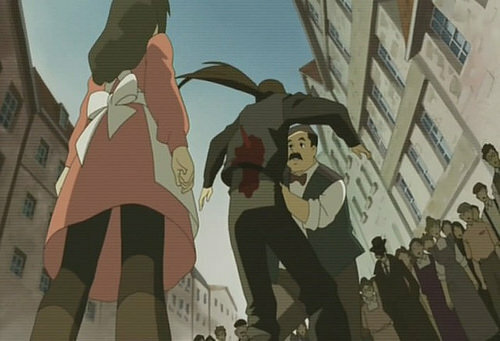 However, by having Kino around, it makes the whole thing worse since the victims have Kino right there to help them, but she decides not to do so. It’s like having a villain as the main character and that’s no fun. Finally, the show tries to be deep and thoughtful in its own way with text in between the episodes and scattered at random points. Kino will also beat you over the head with a message at the end of every episode. The problem is that most of the dialogue ends up feeling very obvious or just like rambling. At least Serial Experiments Lain had aliens show up and cool conspiracies and fights. Lain also had a much better atmosphere and characters. I didn’t even like Lain all that much, but you can feel the difference. Lain is what Kino’s Journey wanted to be, but could never reach. Overall, Kino’s Journey is not a good anime. The animal violence is terrible and the episodes can get way too grim. If this show is supposed to be a calming experience, then it is clearly failing at that. The show also needed a far more likable pair of main characters if it wanted to get anywhere. Some plots never really went anywhere and just showed up to buy time like Kino training her gun skills every night. We get it, she can fight, but do we need whole minutes of her taking the gun out and putting it away again? That kind of training isn’t very fun if there’s no payoff and there should have at least been some music in the scenes. Ugh, I recommend watching just about anything else that I’ve reviewed instead. If you want a dark anime that handles itself well, watch Madoka Magica instead. I guarantee that you will not be disappointed in the slightest. This entry was posted in 3 Star TV Shows, Reviews, TV Show Reviews, TV Shows and tagged Anime, Anime Review, Cartoon, Episodic, Kino, Kino's Journey, No Plot, Review, Slice of Life, TV Show Review by dreager1. Bookmark the permalink. Hey could I use one of your images on a blog? I like wiley, is he yours? None of the images are mine, I got them off of Google.